Well guess it's called an L port. I just checked the calculator and removed the displacement of .24 and the net volume went up .24, so it does calculate. I was just able to use this instead of getting on the PC. I will use Torres for final.Its says 1.75 ft^3 per sub, so 3.5. Do you think I should go a little bigger. Was wanting to 45 the corners but I have no idea how to calculate. here is what I'm shooting for ( this is not my design or deminsons). 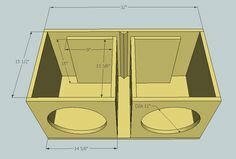 I'm I heading in the right direction with the speaker box calculator or is it totally wrong?